In keeping with recent trends here on the Blog, welcome to our post about IWMW 2018! It’s definitely conference season and we’ve been out about, getting the Dundee name out there. While there have been previous posts on conferences with themes of UX and Content, the Institutional Web Management Workshop (IWMW) conference is more about the overall HE community and web’s place within it. I wrote a post about last year’s event and the sense of community was very much a theme. With that in mind, I am going to, along with some input from some of my colleagues, give you an insight into this trip. This year’s event was held at the University of York’s West Campus over three days. The University’s campus is, unlike the quaintness of York itself, an exercise in brutalism. This is accompanied by the largest plastic-bottomed lake in Europe and what appeared to be an endless supply of ducks, geese and other miscellaneous wading birds. Both the IWMW conference experience and York itself made a lasting impression. From the friendly people I met, to the many geese roaming the stunning campus grounds, the University of York was a welcoming place in a picturesque city just a four-hour train ride away from Dundee. A short bus journey from the train station took us through the ancient streets of York to the university on the edge of the town where the concrete campus is softened by landscaped parkland, glistening lakes, and the intermittent honking of geese. York campus is hoaching with waterfowl. Day 2: Full day of plenary talks including lightning talks, followed by masterclass sessions. Day 3: Half day of plenary talks, with closing by organisation co-chairs, Brian Kelly and Claire Gibbons. Pretty much all the talks were outstanding, the workshops were spot on, the masterclasses brilliant and the social events a breath of fresh air. IWMW is […] a relaxed conference. It’s because of this relaxed nature that it is one of the best networking opportunities around for digital people in the higher ed sector. It also explains the honesty of many of the talks, with those from Alison and Andrew being refreshing personal. You get the sense immediately that at the heart of IWMW is a really supportive community. People are keen to learn and share their – often very honest – experiences of working in higher education. What’s great about this conference is that it’s not just about listening to lectures or going to workshops but also about chatting with our peers from other institutions or the wider field. I had lots of chats about my current work challenges with like-minded folk that were in their own way every bit as useful as the talks and breakout sessions. I was even sober for some of them. There was almost a cathartic air to the plenary talks this year. There seemed to be two main themes to the plenary talks this year; honest and emotional talks about getting through personal challenges, and informative, practical talks about project challenges. Both Alison Kerwin from the University of York [Day 1] (watch Alison’s presentation here) and Andrew Millar, chief of our very own web team at the University of Dundee [Day 2] (watch Andrew’s presentation here), are my recommendations on the emotional side. Gareth Edward’s slick presentation on understanding invisible labour [Day 2] at the University of Greenwich is essential viewing as well (watch Gareth’s presentation here). There was a good focus on content this year, with Keith McDonald’s “Hands off it’s ours” being one of my favourites. Their plans for getting rid of PDFs, removing “informational bias” (a great new term for jargon filtering through the cracks), and the work University of London had done on content ownership is very similar to how we’re working with content. It’s always good to see both how others dealt with the issues, but also that you’re not alone. IWMW feels increasingly content oriented as the years go by, which is no bad thing in my book. There were so many stand out talks for me. Alison Kerwin spoke about the things she wished she had known earlier in her career and it was generous with good advice and very honest about the realities of working in universities (watch Alison’s presentation here). There is no magic formula for getting digital on the table for discussion. It’s all political so know the politics and your institution. There is a world beyond digital. It’s good to have ideals but don’t be idealist. It’s really ok to be not ok.
Don’t be too pig-headed to learn from others. Andrew’s talk on managing stress was open, reflective, and funny (watch Andrew’s presentation here). Gareth Edwards spoke about managing invisible labour – the little tasks that take up huge amounts of your time when dealing with requests from web editors. Gareth’s advice to mitigate this by building consistently, blocking complexity, and maintaining standards. This really struck a chord with me. Jenni Taylor spoke about ‘Resurrecting the Content King’. Jenni’s passion and enthusiasm was infectious when she talked about the various techniques she had used at Cardiff University to engage their community to create great content. Up next were the workshop sessions, and this was a big thing for us as this was Steve’s first time presenting a workshop at IWMW, presenting ‘Solving Problems and Making Friends Using Design Sprints’. 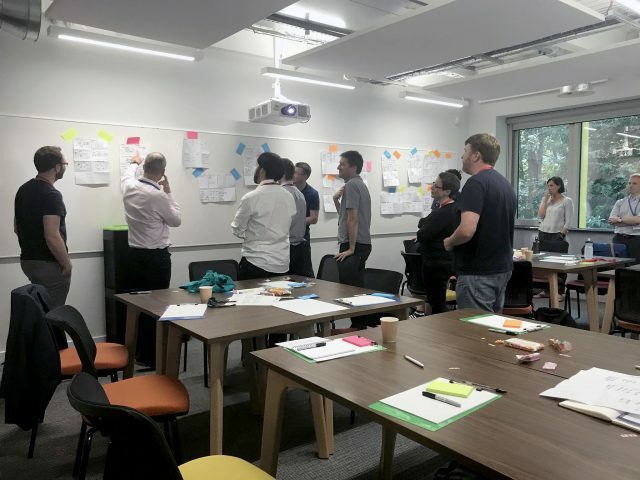 18 people from different universities around the UK bravely volunteered to attend as I took them through the Design Sprint process. We ran a mini Design Sprint during which I forced them at Sharpie-point to get creative and sketch out a solution to an example problem. They presented their ideas, we did some voting, and then we talked about a potential solution. Finally, I gave everyone some exclusive, never-been-heard-before advice on being a Design Sprint facilitator and encouraged my audience to run a Design Sprint when faced with their next big problem. There was some very intense clapping and smiling faces at the end. This may have been because it was time for the free drink, dinner, and shouting at a large TV showing the England match. Personally, I enjoyed the experience and look forward to playing a part in next year’s IWMW. While Steve was presenting, others had the opportunity to attend workshops. [University of] Edinburgh’s workshop on user testing was really useful. We’d recently completed a similar exercise with our IT pages where we discovered there was simply too much information and it was getting in the way of completing the tasks. Observing the difficulties faced by the students on video, then re-working the content in groups to solve this issue really focussed the mind on getting it right. A new concept, added to this year’s conference, is that of the lightning talk. Similar to a plenary talk, lightning talks consist of no script, no presentation, just five minutes of unbridled talking about a topic close to the person’s heart. What stood out for me, and exemplified what IWMW is all about was a 5 min lightning talk by Kevin Mears from the University of South Wales. Kevin has been a regular at IWMW for as long as I can remember and a fellow advisory group member. Kevin isn’t a public person and he prefers to stay in the background. He doesn’t like speaking, never seeks the limelight and would admit himself that the thought of doing a plenary talk petrifies him. However this year we gave people the chance to do very short (5mins max) talks on a subject of their choosing. One of Kevin’s many outstanding talents is creating sketchnotes of the conferences he attends and something he is very passionate about. He creates beautiful visual sketches of the main points of a talk condensed into one or two pages (you can see more at https://www.mearso.co.uk/). We encouraged him to do a talk and he not only did it, but absolutely nailed it. Up next were the masterclasses! As one of the three people from the University of Dundee that was presenting, I was really looking forward to Thursday afternoon for the Masterclass session I was running on Customer Journey Mapping. Attendees book their places in advance and this Masterclass was fully booked. I was, therefore, expecting twenty people. I ended up with twelve, which worked out as four groups of three. Each of the groups were given a different scenario to customer journey map. I started off by talking the groups through a customer journey, which was me booking a holiday. I used Google, STA Travel, Thomas Cook, Skyscanner, British Airways and Uber – to name just a few. I then showed several examples of customer journey maps to highlight that no one sizes fits most – they all look different. Depending on the audience for the map, the story that you are trying to tell with it will change. A map for a set of web developers will look different to the one presented to senior managers, for example. The groups then started thinking about the steps in their scenario. Once we had the steps fleshed out, we then started added in actions, questions, emotions, touchpoints, fears, influencers and goals. There was a lot to get through in 3 hours, but the teams did fantastically well and were able to produce a customer journey map. Hopefully, using these skills, they will be able to go back to their own institutions and create their own. Both Steve’s workshop and Rob’s masterclass proved to be very popular, demonstrating how we are leading the way forward on how our organisation think both culturally and digitally. While Steve and Rob were off winning friends and influencing people, the rest of us took the opportunity to attend masterclasses. Claire Gibbon’s masterclass asked us to ponder the what, why, and where of digital governance in HE. Governance is one of these topics that people often talk about in a very abstract sense but Claire broke into down into a usable framework and gave us some very practical advice. ‘Start with small wins’ is just one of the pearls of wisdom that I took away. I also realised that nobody really knows what digital transformation and digital strategies are all about. Paul Boag’s usability masterclass was a characteristically energetic look at the various approaches, techniques, and straight-up tricks we can use as webfolk to lay waste to our enemies help us collaborate effectively with stakeholders to produce user-centric web content. I left feeling encouraged, upskilled and extra dastardly. Which is an achievement because I was already moderately dastardly. The open nature of the conference, compared to others, means teams are much more likely to share ideas with each other freely. This helps us all as we all face similar challenges. This is what IWMW is all about. The sharing of ideas in a community that is both welcoming and supportive. We don’t try to outdo each other, and we don’t try to hide stuff away that some might consider a competitive advantage. We talk about our successes and our failures and figure out collectively how to solve both the technical and personal issues that we face. Long live IWMW! In conclusion, this year’s IWMW was just what every conference should be: engaging, educational, fun, and covered in geese. Gary came to the University of Dundee in 2006 to study English & Film Studies. After graduating in 2010, Gary returned in 2014 and in 2017 joined the Web Services team as Web Support Assistant. When not tackling support requests, Gary can be found wandering aimlessly around campus. If found, return to Caroline Petrie. Andrew graduated from the University of Dundee in 2003 with a BSc (Hons) in Applied Computing. He started working for the University in 2004 and spent four years working in the Careers Service and across wider Student Services. In 2008 he moved to the College of Life Sciences to act as their web developer, eventually expanding in 2012 to take on the development of Medicine, Dentistry and Nursing sites as well as heading up their IT unit in 2014-15. He became Head of Web Services in 2015 and brought together teams from across the University to create a unified web services team for the University. As Web Content Manager for the University, my role is to improve our website through better planning, creation, delivery, and governance of content. Morag studied dinner table trivia at the University of Edinburgh, and has been working in web design and content for over a decade. Her primary skills are interruption, digression, and convincing you that her idea was actually your idea. Her hobbies include feminism, gin, and stockpiling for Brexit. Once described as 'unapproachable and rude to children', Pete nevertheless strives towards the goal of making the content of our website more friendly, readable, and useful for our visitors. Surprisingly handy with a drill. Rob graduated from the University of Dundee in Applied Computing BSc (Hons) and Design Ethnography MSc. He has been working for the University since 2013. Bringing the technical aspects from computing and the user research aspects from ethnography, he is our User Experience Manager. Rob is often out of the office speaking to users and testing the website to new design thinking. Steve joined the team as Web Design Manager in May 2016, bringing 13 years of commercial experience to the university after working with clients across a wide range of industries covering science, tech, retail, media & entertainment, healthcare and education. Steve has worked with clients including Gartner, King's College London, Kwikfit, Royal Society of Edinburgh, Girl Guides Scotland, St. Andrews First Aid, Clash Music, Hutton Institute, amongst others. Steve is responsible for managing the design team and works with web designer Ryan McLauchlan to deliver enjoyable, unique and effective digital experiences for students, prospective students, staff, and anyone else who interacts with our website, landing pages, emails, presentations and other digital marketing assets. Outside of the workplace, Steve enjoys spending time with his young family and many pets. He climbs walls for fun.